With a history of use dating back 2,000 years, milk thistle (Silybum marianum) benefits a variety of ailments, including liver, kidney, and gallbladder disorders. Its active components -- a group of flavonoids collectively known as silymarin -- help detoxify the body, especially the liver, and research finds silymarin to have potent antioxidant and anti-inflammatory properties. Milk thistle helps the body by drawing out toxins that can cause a range of symptoms and diseases, including high cholesterol, diabetes, kidney stones, skin damage, and potentially even cancer. Due to its beneficial effects on the liver, milk thistle is often a suggested treatment for alcoholic hepatitis and alcoholic cirrhosis. Studies show that milk thistle improves liver function and increases survival in people with these conditions. Milk thistle has been shown to decrease or even reverse damage to the liver caused by antibiotics and other prescription medications, pollution, heavy metals, pesticides in our food supply, and other toxic substances. It removes toxins and helps rebuild liver cells. While more studies are needed, promising research suggests that silymarin and other active substances in milk thistle may also have anti-cancer effects. These substances appear to stop cancer cells from dividing and reproducing, shorten the lifespan of cancer cells, and reduce the blood supply to tumors. In one study, researchers concluded, "There is strong preclinical evidence for silymarin's hepatoprotective and anticarcinogenic effects, including inhibition of cancer cell growth in human prostate, skin, breast, and cervical cells." 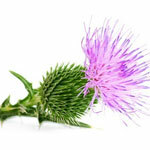 Because of milk thistle's powerful antioxidants, this herb also has anti-aging effects. By preventing free-radical damage throughout the body and removing toxins from the blood and liver, milk thistle helps slow the aging process both internally and externally. Milk thistle is generally regarded as safe with mild side effects that may include an upset stomach and nausea. If you're pregnant or taking prescription medications, talk to your health care practitioner before taking milk thistle.